For a so-called fashion blogger, I'd say that my outfit choices are pretty basic. I don't have the confidence to rock a multitude of patterns at once or funky neon colours or a combination of them both. For me, jeans and a nice top will forever be my go-to winning combination - because would I be a millennial woman otherwise? Despite that, my boyfriend has openly said he's not the biggest fan of some of my outfit choices. Bright colours are a no in his book, as are frilly numbers - I'm sure there are many more things that he hasn't voiced just yet haha. The other day he very kindly offered to take some photos for me for my Instagram - the perks of having a photography lovin' boyfriend - and after hours of me wearing a particular top, us taking photos with me wearing it and then going out and about in it, only then did he decide to tell me that he pretty much hated it and thought it looked like a doily. OH MEN! The amount of times I've gotten a 'hmmm that's, erm, interesting' out of a man is bloody countless, and I'm not alone, I met with a friend the other day who said that her husband has a particular signal to indicate he's not impressed with a certain outfit choice. Don't get me wrong, I would never change any part of myself for a man - or anyone else for that matter - and fortunately, my boyfriend still adores me despite some wacky outfit choices. However, I thought it'd be interesting to see how many items in my wardrobe are deemed man-repellent. Everyone has a denim silhouette that works for them, but it seems as though mom jeans work for everyone. The high-waist - and subsequently perky bum - and often-cropped length creates the ideal cut for pairings with trainers or even a pair of heels. Versatility all the way. You've come up with a million excuses to not add a pair of culottes to your wardrobe: they make your legs look short, you don't know what shoes to wear, they fall at a weird length, finding the perfect fit is impossible. But this wide-legged look has proven to be more of a staple than a fad. In fact, store shelves are showing that culottes are sticking around for yet another season, highlighting their versatility and staying power. Whether it’s a casual frill or full-blown frou frou, ruffles are a key trend this season and also one of the easiest to wear. 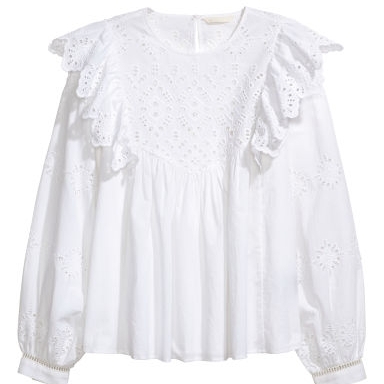 But if you're thinking that ruffles sound more sartorially suited to either a seven or 70-year-old, we can assure you that they can be chic, directional, mature and playful, depending on the way you wear them. Firstly, you're reducing all your morning wardrobe options to just one item and secondly, if you pick the right pair you'll find yourself feeling much more chic and put-together despite the baby-grow connotations. If they look like rejects from the 80s, sure, all fashion loving women hate shoulder pads too, but if they’ve been designed to create an interesting shoulder line or give your silhouette a more defined shape, then hey I'm on board! Plus, if a man is intimidated by your now-broader shoulders than thats his insecurity!